The 2010 Michigan Football team will feature two permanent captains to start the season. They are 5th year seniors FB/LB Mark Moundros and LG Stephen Schilling. Schilling will represent the offense, and Moundros will represent the defense. These two seniors were picked by the team through a vote. The idea of two permanent captains was an idea that the senior class had, and Rodriguez agreed with. The team will also have two rotating captains for each game throughout the season. The team will also vote to elect two addition permanent captains at the end of the season. ANN ARBOR – University of Michigan football coach Rich Rodriguez announced tonight (Aug. 9) that fifth-year seniors Mark Moundros (Farmington Hills, Mich./North Farmington HS) and Stephen Schilling (Bellevue, Wash./Bellevue HS) have been elected captains of the 2010 football team by a vote of their teammates. Schilling will represent the offense and Moundros was selected as the defensive captain. 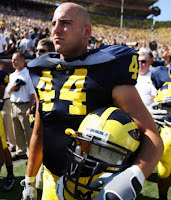 A three-year letterman, Moundros will be a two-way performer for the Wolverines in 2010. He practiced at linebacker throughout the spring and is the team’s starting fullback. Moundros has recorded 15 special teams tackles during his career. He rushed the ball three times for 14 yards and one touchdown and caught four passes for 13 yards and one TD in his career. Schilling has started more games than any other Wolverine, making 36 starts in a possible 37 games. He started at left guard in 2009 after starting at right tackle during his first two seasons. Schilling earned NSCA All-American Strength and Conditioning Athlete of the Year honors during the 2009-10 academic year. 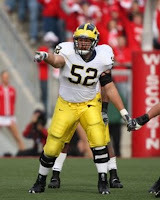 He was 2009 All-Big Ten honorable mention and the co-recipient of the Hugh R. Rader Jr. Award as Michigan’s top offensive lineman. He has started 22 games at right tackle, 12 contests at left guard and two games at right guard. The Wolverines will elect game captains on a weekly basis and an additional two permanent captains could be selected at the end of the season. Hear Ye! College Football Pick'em League! 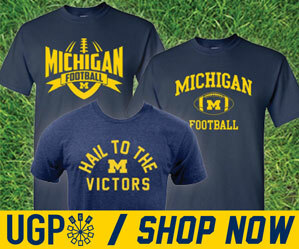 Michigan to Play Alabama in Dallas in 2012?